Quiet Park. No Trains No Freeway No Airplanes. 800 ft of no-bank sandy beach. Watch large ships go by. Only 3 miles off I-5. Easy day trips: Mount St. Helens, Multnomah Falls (2nd largest in nation), 30 mi to Portland. 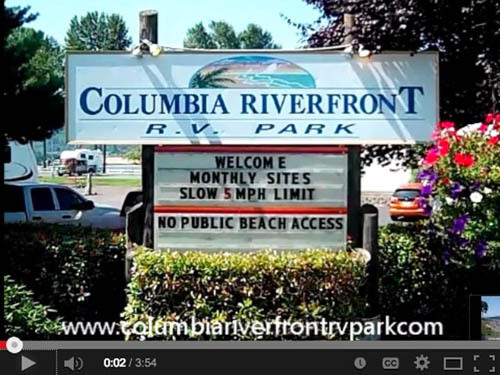 Nice park, big spaces, large grass area, nice beach along the Columbia river with a nice view. Dogs must be kept on a leash or management will say something. Bathrooms and laundry were nice and clean, pool was great, trash dumping locations were a long walk from our space (70) was told by staff to walk through someones space and did not want to do that. Park needs a security fence along the north side between spaces 68-76, these spaces back right up to a local public recreation area where lots of people come and go on a daily basis, I felt like I had to keep my camping gear locked up. Maintenance staff was friendly but management could have been warmer. Seemed like they had plenty of people wanting the spaces and they knew it. This park is very nice. It's right along the river and you can sit on the grass and watch the ships go by. It's very peaceful and relaxing. It's also kept very clean and nice. I did not use or check the restrooms at all, so I cannot rate those. It is a bit of a distance from Portland. It's about 25 minute drive to the furthest out public transportation/MAX train station. But it's easy to get to, and we enjoyed exploring the city. Woodland itself has some stores nearby, including a Walmart and a Safeway. The staff at the resort was professional and helpful. We enjoyed our stay, and we already have a reservation to return. 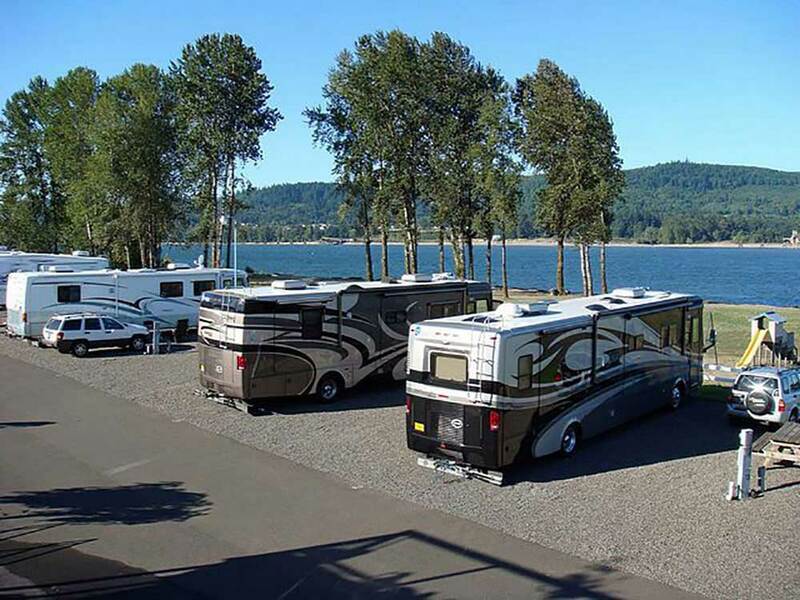 We absolutely LOVE this RV Park! Yes, they have rules, but they are in place for good reason! We have stayed here two times, and will be visiting them 3 more times this year! Very clean, beautiful lawn! Great wind for flying kites (which is mine and my husbands passion!) I have found the owner very acommodating! She even booked us for 1 night for next Labor Day Holiday (2018) which is unheard of! Excellent Cable & WIFI! No glitches at all! Give this place a try! Yes, be sure to bring warm clothing as they are right on the river and very windy! Also, they do an absolutely fantastic fireworks display on the 4th of July! Great location, easy to get to if you use exit 22, and very quiet for a rv park. We loved watching the ships and barges on the river, as well as the people fishing for salmon from the shore. The park design was good, as was the staff. The laundry was adequate, but needs upgraded. The swimming pool was very shallow and basic. This is a very nice park; but pricey on a monthly basis. Columbia Riverfront is always a relaxing place for us. It is so nice to sit in the RV or on the lawn and watch the ships go by on the river, day or night. The park is well maintained with lovely landscaping. They have nice amenities from groceries to RV supplies to propane. We appreciate the quietness of their location and relatively easy commute down to Vancouver WA and Portland OR. The nearness to the new Ilani Casino was nice this visit as well. We would recommend this park! Stayed here overnight. Very nice park just like the pictures. Nice bathrooms. Beautiful view of the river. Quiet location in rural area. Only reason I did not give it 5 stars is sites are small and few trees. Lady at the desk was friendly and helpful. The rules others have complained about are why this is such a nice park. Enjoyed a very nice two-days at this well maintained park. The full page of rules seemed a bit daunting, but we didn't have any issues. Our two grandsons (ages 8 and 4) had a great time riding their bikes, playing on the sandy beach and in the pool. Nice quiet relaxing stay. The large petunia baskets are gorgeous and very fragrant. Free cable and WiFi are a plus. If there was a little more room between sites I'd give 5-stars. FANTASTIC!!!! What more can you say about this absolutely gorgeous park! Welcoming friendly hosts, a wealth of information, told us about Josie & Sadie's Bakery in La Center, WA not far from their park, incredibly delicious breads, pastries and pies, forget about any diet if you go in there, just the fresh bread aroma will make your mouth water. I read a review about the "wind", it was windy a few hours in the afternoon, but nothing to write home about, that's why were in an RV to enjoy the outdoors, whatever Mother Nature is serving at the time isn't it? The showers/restrooms were immaculate, well stocked. Didn't use the laundry facilities but "peeked" in, looked great, new/modern. Great views, huge clean well manicured lawn/grass area. The hosts are great, some people call them "rules", BUT in this case, I think we should look at them as guidelines, so all of us RV'ers can enjoy their pristine beautiful park. Excellent level gravel pads, hard surfaced (blacktop) streets, more than ample room in/out, with extra room for your tow Excellent WiFi too, FREE Only downside we had was, not more days to stay at this beautiful park, so quiet, so clean with Columbia Riverfront views, that can't be beat, we'll be back for sure! We met friends here for a weekend on the Columbia and initially thought "wow, what a place". That thought soon faded though with the last arrival of our group. Their site numbered 50 AMP service was being used by a head in parked motor home in the adjacent site. The host was very rude, condescending, and arrogant in his explaination that this is a "first come first serve situation" even though the sites are clearly marked with numbers on the power meters. There are dual hookups for water and sewer however. We were all offered a refund to "go away" when we suggested that a reserved site with 50 AMP service should have its 50 AMP service available. Additionally, the electrician in our party pointed out that the sites were designed and permitted for 50 or 30 AMP, not 50 AND 30 AMP as the park host suggested. More annoying than the power situation was the hosts attitude. We won't stay here again. This is a beautiful park, but they have rules without reason and the staff has more power than personality. We tried to get our money back within 15 minutes. I would not go back! This is a beautiful park and a Top 100 park from Good Sam. While it is quite beautiful and right on the river, the rules and office staff are a very off-putting. From the very first phone call to make the reservation to the check in and out, the office staff was quite curt and short, just short of rude. Be aware that if you do not present your Good Sam card before you even give your name, they will NOT give you the discount - no matter what! This is VERY AGAINST GOOD SAM RULES! I can see why this park gets good rates as the amenities and grounds are nice. The grass is lush and full and heavily watered even in an extreme drought. However, watch out for the sprinklers. They run them for over 14 hours each day and they come on and go off with no notice. You can be sitting on the grass and all of a sudden you are drenched. Also, because they water so much, you can never walk yourself or your dogs on the grass without getting soaked. It is a big pain to wipe down the dogs each time they go outside. The beachfront access and beach is amazing. However, behold the RULES! The rules are HEAVILY enforced when making the reservation on the phone and even more so in person. While I don't have too much problem with the rules, as we always abide by them, the way they are enforced seems a little excessive. They do not mince any words and go over them with a fine tooth comb - all 2 pages of fine print! She stated that if you even park a tiny hair over the grass line they will make you move and don't even think about your dog barking - even once. They strictly say barking dogs are not allowed on-line and in their printed rules. Now, when do dogs not bark? We don't allow ours to bark more than just a first few barks of hello because we don't like it either but how can you stop them from completely barking? They also do not state anywhere on line or any of their literature, but they charge $2 a day for 3 dogs or more. They also charge for additional people over 4 and you can only have 6 max. Also, they repeatedly state that dogs cannot be off leash and the leash must be in your hands at all times. HOWEVER, that must not apply to the people who work here as we repeatedly saw someone driving a golf cart on the grass with two dogs in the cart. This person would throw a tennis ball ahead of the cart about 25 feet and then the dogs would jump out and run after the ball, get back in the cart and start over again. We have addressed the watering situation. The entire park is the site of years of river dredging spoils. Based on recent borings we are sand and nothing but sand as far down as 60 feet. The flower beds all have been created with hauled in topsoil, but the lawns are sand. It took us three years to develop enough root base to support the grass through the summer and not have the lawns die out during the winter. In order to maintain the lawns through the summer it takes lots of water. Three days without water and the lawns will be brown for the rest of the year. In August of 2014 we were able to increase our irrigation source so that we can now run two irrigation pumps at once. Accordingly, we have re-scheduled almost all of our irrigation watering to the non-daylight hours. Irrigation starts at 10:00pm along the road and progresses throughout the Park overnight, ending at 10:00am at the far south riverfront. In total, there are 32 watering zones. Only two of which run at any one time and their duration is based upon moisture sensors within each zone. Unfortunately, sand holds very little moisture. With this change the sprinklers on the three acre front lawn no longer operate during the day. What a beautiful park! Right on the river - we watched the barges and even saw a paddle wheel boat go by. Wish we could have stayed longer. We would definitely stay here again. Staying on the Columbia River is a beautiful place to be. Unfortunately, they don't tell you on their website that it's windy, really windy, most of the time. If you have allergies, you will not be able to be outside unless you leave the park and get away from the wind. The park has a gorgeous large grass area for pets and families to walk through just before the shore line. What you learn quickly is, however, they are constantly watering the grass area so you are walking on it at your own risk! You never know when the huge sprinklers are going to go off. You literally cannot enjoy being on the grass. We tried to check out early by giving more than 48 hours notice and they refused to refund our money. They also do not have anything about refunds in the paperwork you receive, however, they tell you that there is a sign on the counter that we should have read. The office staff is quick to tell you "No" and that's it. There isn't any discussion about anything once they've told you no. We definitely did not feel like they cared about our stay there or what we thought about it. They even came and told a traveler next to us to leave that had asked for an extra 30 minutes past check out to finish cleaning up from breakfast. The website shows an upstairs that is open to guest. There is a barrier in front of the stairs that keeps you from going up there. So, you can't actually go up there to enjoy the view like they imply by their pictures. Anytime you have a visitor come to see you, they charge them $5.00 to park their car there. Finally, the laundry facility is old, dirty and the room looks like it hasn't been cleaned in months. We took our clothes elsewhere. The upstairs of the Office building is available by Reservation Only, as stated on our Website and is exactly as pictured on our Website. If the stairs were blocked off the sign said “check with the Office”. The stairs are only blocked off when there is a reserved event scheduled. ( event setup, the event, teardown and clean-up ) Did you check with the Office? Perhaps if you had, you would have an answer to your concerns. From Jct of I-5 & Exit 22: Go 1-1/2 mi W on Dike Access Rd to Dike Rd, then 1 mi S on Dike Rd (R).